The redwood Jobmaster is a unique, leather boot from Wesco designed with versatility in mind. This working boot will suit you well through any number of situations: hikes, hunting, construction work, logging, and much more. The Jobmaster is not a boot you will have to switch out often, as it can be worn in a variety of situations. Hikers everywhere love the feel and look of these earthy boots as they climb over rocks or dead trees while exploring the wild or just working. Crossing streams and getting out in the rain isn't as big a hassle either as these boots are water-resistant. Hunters enjoy the look of these boots as well as they are easier to camouflage against the vivid leaves littering the ground in autumn. 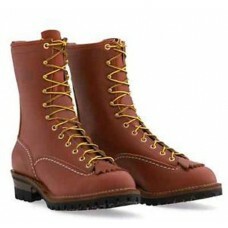 Construction workers like the heft and sturdiness of these Wesco beauties. Combining seven ounces of full-grain leather with white, heavy stitching gives the Jobmaster a form that withstands the toughest of environments. Brass hardware blends in well with the redwood color of the boot as well. This versatile boot is not only tough but also created ti redyce injuries and accidents. You'll have a much harder time slipping on steel beams at the site or deads logs on that nature hike with the 100 Vibram lug sole on this boot. Comfort is also the name of the game with these working boots. Foot pain is something every person worries about, but PORON performance shock absorbing inserts aim to ease your worries. These inserts help deal with the pressure and weight you put on your feet with each step. If you worry about the smell of sweat after a long day at work, Wesco has you covered by adding in sweat-resistant full-leather insoles. This redwood color boot is a handsome addition to any person's foot wardrobe. Being both practical and fashionable has never been so easy! Try out this boot in black or brown if redwood isn't your style! 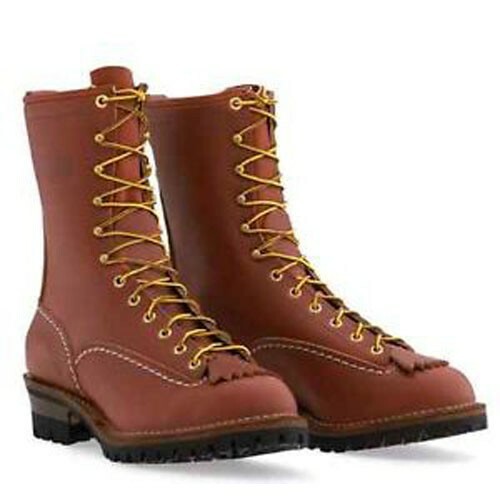 Not stocked in Stompers store - Drop shipped direct from Wesco factory.